Philosopher Dr John Soyland with Dion Carbery, sadly passed. Dion Carbery died over six years ago on 7 August 2008. 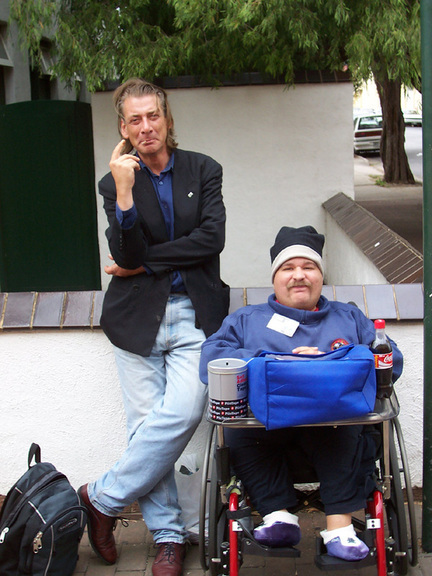 He sold Big Issue Magazine from his wheelchair in the lane alongside Uniting Care Wesley Port Adelaide. Dion was certainly a businessman. He’d hand me a magazine and offer a receipt before we’d hardly said hello. He liked to debate with people. His voice tone enlivened listeners. He had a good voice. Dion was lucky that way. Whether he was shivering in the cold laneway or boiling during heat waves his voice tone remained upbeat, up-tempo. One month he raged against a woman who borrowed $500 from him then disappeared. When he demanded repayment she got someone to threaten him. He was also mugged by three thirteen-year-old boys. It was a Saturday morning when they snuck up behind his wheelchair outside Woolworth’s and grabbed his money tin. 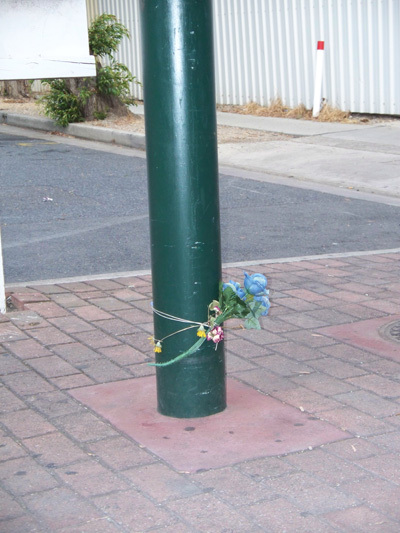 Police didn’t lay charges, but when the Port Adelaide Messenger newspaper reported the incident strangers turned up with fifty-dollar notes for one magazine, “Keep the change.” Dion smiled at the irony. He had trouble getting around and spent a fortune on Taxis. One disappointment was not being able to get to the Big Issue’s 10th birthday celebration in Victoria Square. He was their star salesman. Dion Carbery hated Port Power football club with a vengeance. He’d wear that huge Crows hat in the middle of Port Adelaide, even during the finals. His voice turned nasty and menacing if anyone uttered a good word for Port Power. Their barman at Alberton refused to serve him a drink ten-years ago and the whole club paid for that mistake. Dion wouldn’t forgive them. He got a blood clot in his tiny knee where it bent around the seat. Some agency gave him a piece of foam to put under his knee and a block under his foot to get the blood flowing. Doctors prescribed pills to attempt to dissolve the clot. He spent long periods in the Hampstead Rehabilitation Centre and was critical of the lack of knowledge some people there had of Spina bifida and Hydrocephalus. Dion lived mostly alone and during a short period when a number of his family fell ill and died, or were injured and died, he told his mother to not visit him while she was caring for others in the family. He didn’t want to burden her with his condition. Dion died of a heart attack at 31. It seems in the balance that he gave more than he took. Many people are in grief at his death. He might not have realized this would be the case.